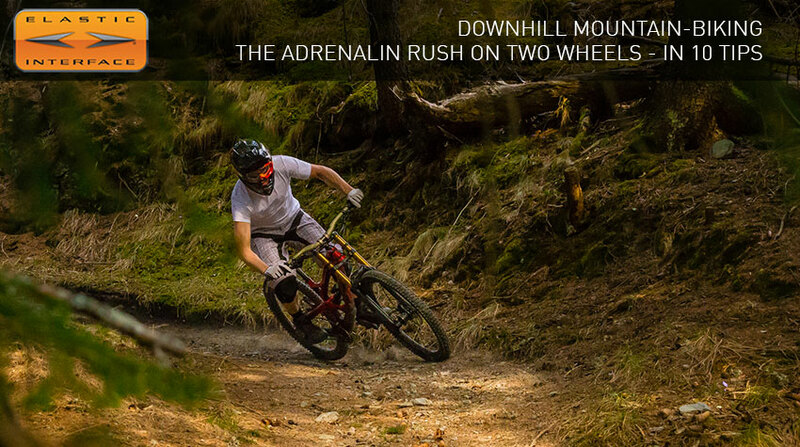 Downhill is defined as the ‘Formula 1 of mountain biking’. It is indeed the most spectacular and exciting amongst all disciplines, and the one that requires the best technique, knowledge of the machine and athletic strength. Find here 10 pieces of advice, from different angles, on how to get better in DH riding. Back in the ’70s the pioneers of downhill started throwing themselves down the hill on some modified cruiser-style bikes called “klunkers”. It is only in the ’90s, however, with the advent of dual-crown forks and advanced suspension designs, that a real distinction between ‘normal’ and downhill mountain bikes became clear. The first UCI Mountain Bike World Championships were held in 1990 in Durango, Colorado, while the first edition in Europe took place in 1991 in Italy (in Ciocco, near Lucca). 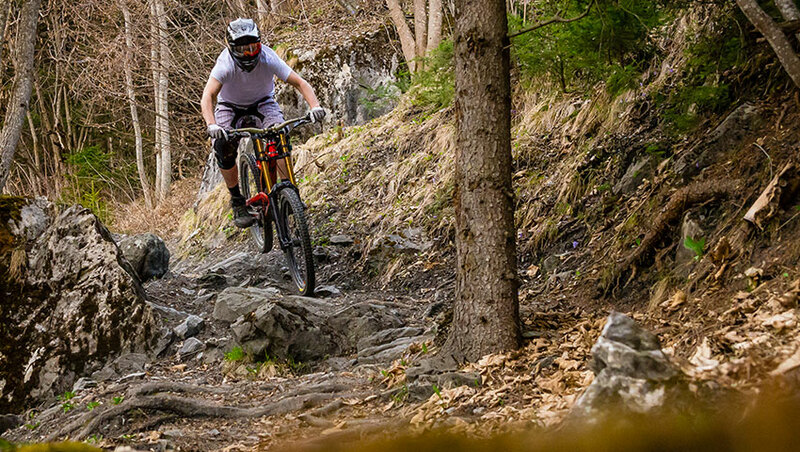 Nowadays, after about 30 years, downhill has changed in many ways – bikes, riding style, tracks – but one thing has remained the same: the adrenalin that runs free through your veins each time you tackle a downhill track at full speed in the woods. Starting from the basics – bike, position on the bike, use of brakes – up to aspects such as how to train in the gym and the right equipment to choose, find here our 10 tips to get better in the world of downhill. Before you start practising downhill, you need to get a basic understanding of your rig, the DH bike. Its size, tyre pressure, suspension set-up, arrangement of handlebar, brake levers and transmission shifters: they all need to be tailored to the rider’s proportions and weight, to his/her riding style and to the conditions of the trail ahead. There are a number of factors at play and only a correct balance of all of them can lead to top-notch performances. 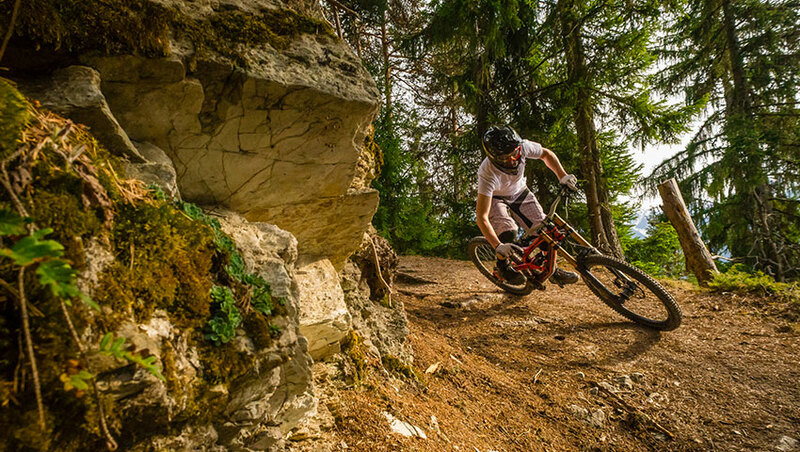 If it is the first time you tackle DH riding, you should get some advice from someone experienced or perhaps attend a course of bike set-up and downhill riding. A good body position on the bike is critical in all MTB disciplines. 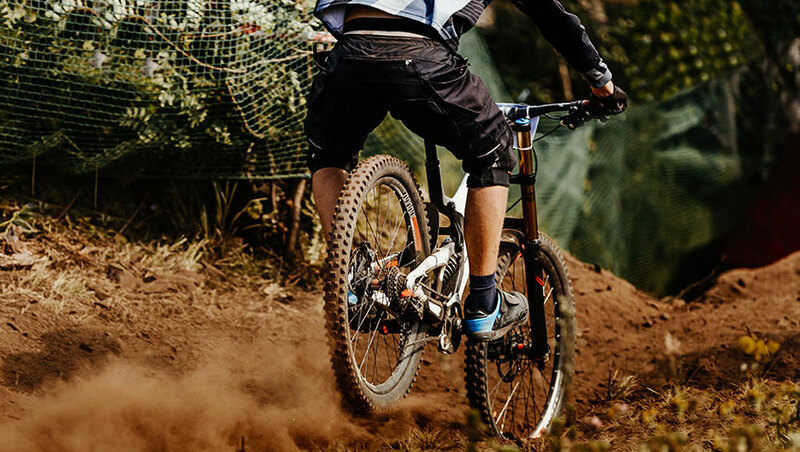 As we pointed out in our guide to The perfect posture for downhill riding, when descending, a good rider’s position requires standing up in a centred position on the bike, looking ahead, with open elbows, low heels and knees slightly bent, ready to absorb the impact forces of the obstacles. Looking ahead is the rule number one in mountain biking: it allows you to anticipate the course and react quickly, and never be caught off-guard. Being able to read the terrain is a skill that comes with experience, but getting used to looking 3-6 meters ahead does wonders for 90% of riders. If you cannot manage it, you simply have to slow down. When riding downhill, the pedals need to be level; this means, with the cranks at 3 and 9 o’clock when looking at the bike from the side. This gets you into a better stance to ‘pump’ your bike, i.e. to transfer your body weight through the pedals onto suspension and wheels, prompting grip and speed. Bike handling needs to be active, anticipating obstacles and absorbing holes and compressions. The weight of the rider pivots on the bottom bracket: whether the bike moves up or down, left or right, the rider needs to respect an imaginary vertical line from the core (the abdominal area, the hips and the pelvis) to the bottom bracket of the bike. This creates a ‘rider-MTB system’ that is stable and dynamic at the same time, with constant grip at the wheels. Once sight, position, and weight distribution on the bike are correct, we can move onto the use of the brakes, that in downhill riding makes for a real ‘art’. Braking is done with one finger only. While braking, the hands need to make like a fist around the grips, to keep a good hold on the handlebar and not get tired: for this reason, brake levers need to be correctly positioned as well. Brakes can be our salvation and in addition to regularly checking their condition and proper functioning, we also need to learn how to use them, with a light and precise touch. You need to feed your brakes gently, modulating the amount of action over the front and rear brake depending on where and in what stage of the braking process you are. During long descents, braking should be done in an ‘on-and-off’ basis, frequently easing the brakes off not to overheat them. Try to use the front brake more over straight sections, steep gradients and before a corner, weighting the front wheel to improve grip: you will find that you never realized how effectively this works to slow down. Not banked, flat or off-camber turns are really the most technical type of corners to negotiate. As mentioned in paragraph 3, throughout the corner the weight of the rider must remain on top of the bottom bracket. Lean the bike in, in order to make the side knobs of the tyres bite the dirt: for this to happen it is also important to push the outside foot down (pedals at 6 and 12 o’clock) and to move your hips outward to the side of the saddle, while the outside elbow raises away from the body. The upper body is weighting the front end of the bike while the head keeps straight in line. The look is around the corner towards the exit. Practice the movement somewhere like a car park to learn the movement; it will be easier then to just repeat it on trails. In turns providing cornering support for the rider (also called banked corners or berms) you can keep both pedals level to the ground or you can drop the outside pedal; the important thing is to be dynamic while cornering, braking before entering the turn, and compressing the bike while in the middle of the corner, in order to be faster at the exit. Berms are easy to ride if you use your legs properly and you keep active on the bike. The look is always around the corner towards the exit. Mountain biking is a very physical sport and the downhill discipline requires, in addition to considerable mobility in the saddle and excellent balance, some specific qualities such as high levels of strength, power output and sprinting ability. However, practising other sports – swimming, road cycling, skiing or running – can be useful to improve physical conditioning, or to sharpen the reflex response and train different muscular groups. All experiences that make for a more complete biker. As we explained in our guide Enduro MTB: 10 tips to improve your performance, working on strength, power output and sprinting ability in the gym or at home with specific exercises can be very useful to improve performance, avoid crashes and injuries, prevent cramps and pulled muscles and manage your energy levels in the saddle, especially while racing. Try “functional training”: alternating sessions of isometric exercises, aerobic floor exercises, work with gym equipment and proprioception tasks. Multi-articular exercises are especially useful to develop strength and power output: deadlifts, squats, bench press, pull-ups, military press and lunges, with reasonable weight, low reps and complete recovery in between. At the beginning, it is essential to have an instructor that provides you with the guidance you need. Also, you should not neglect to stretch and make exercises to improve mobility and range of motion. Downhill riding requires body armour: in addition to, obviously, a full-face helmet with non-removable chin guard, we recommend knee pads, back protector, elbow pads and long-finger gloves. Some feel better by adding chest plate, protective shorts and neck brace, the protection for the neck. It is all about being comfortable, protected in the event of a crash but without feeling movement is too restricted. Finally, goggles, a good pair that fit your face well and do not fog up as soon as you start riding. The shoes can be for flat or for clipless pedals (when a cleat is fitted to the sole), depending on experience and personal preference, as long as they are of excellent quality; the same is true for the pedals. A long-sleeve jersey on top of a technical baselayer, long trousers or shorts of sturdy material and, as explained in our guide 10 mistakes to avoid when using bike shammies, a good, discipline-specific chamois make for the complete attire of the perfect downhiller. Carefully following these 10 tips, practising step by step every new idea and technique we explained, taking time to make it yours, we are confident you will get your reward and improve your downhill riding. This all together is aimed at acquiring more confidence on the bike and enjoying at its best the spectacular discipline of downhill.